BL Lac is an interesting star with an interesting history. It is the prototype of the BL Lac class of Active Galactic Nuclei (AGN). You read that right, BL Lac isn't actually a star at all, but rather an extremely bright galaxy. But it took astronomers a while to figure that out. In 1926 BL Lac was discovered to be variable by Cuno Hoffmeister at Sonneberg. Close monitoring of the variable began almost immediately. However, almost 40 years later in 1969 a bright radio source was found to share its location with BL Lac. Quickly BL Lac was "promoted" to the newly discovered realm of quasars. BL Lac was one of only two known (non-cepheid) extragalactic variable stars at the time. This was not the end to BL Lac's 15 minutes of fame, however. Quasar research took off in the 70's and soon other quasars were classified as "BL Lac objects" and eventually they all were placed under the blazar moniker. BL Lac objects & blazars are highly variable and exhibit a featureless spectrum. Even later, in the late 90's, the blazar definition was loosened because BL Lac lost one of its earlier defining characteristics (a faint absorption line was detected where it was previously thought blazars had none) and they didn't want blazars to lose their most famous member! In the 1960's a bright point in the sky caught the attention of astronomers all over. It was a thirteenth magnitude star in Virgo with strong radio emission, 3C-273, for which they could not understand. Martin Schmidt of Cal Tech realized that the spectral lines fit the familiar pattern of the hydrogen atom, but only if the spectrum was greatelt redshifted. He commented to his wife when he went home that night that, "Something really incredible happened to me today." The redshifted spectrum meant that 3c273 had to be very far away, and thus was not a star at all, but an intrinsically bright galaxy! With this realization "Holy Ned broke loose," Allan Sandage, said in a 1992 Sky & Telescope magazine article. It was indeed a momentous shift in astronomy. Sandage added, "From 1960 to 1970 all the spectroscopists ran into the field. It was a Barnum and Bailey circus...". Eventually astronomers figured out that the object was just one of many, and that they were more common and brighter at optical wavelengths than radio. The term Quasi-Stellar Object (QSO) was coined. It was later shortened to quasar, much to the rejoicing of editors everywhere. So what are blazars and BL Lac objects? You could be forgiven for thinking it refers to a heavy metal punk band. But Blazars are in reality quasars with their jets pointed straight at us. Take a punk rocker's spiked head. As he thrashes on stage he throws his head up, down, and sideways. The spikes precess, or change their pointing direction. Eventually one of those points is aimed straight at you in the audience. 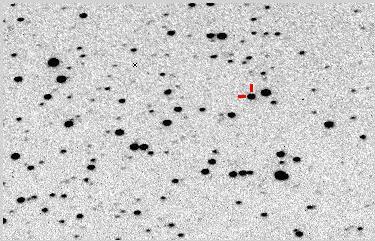 According to current models, that would be a blazar. But instead of heavily died hair, its high-energy photons emitted through synchotron radiation, following the spirals of an intense magnetic field. The source of the magnetism is something a lot denser than a punk rocker's cranium: a million to billion solar mass black hole. >As matter swirls around and falls into the black hole, it emits most of the energy we receive from the quasar. Much of the energy is emitted along a cone of light or a jet perpendicular to the plane of the host galaxy. We are looking down the tube of a quasar, so to speak, at the main energy source. Quasars are very strange things. They shine in almost all wavelengths (most efficiently in X-rays ), have broad lines in their spectra much different than normal stars and are really bright. Quasars are the brightest objects known. So far, they have been seen at a red shift of 5.5. That is 13 billion light years away, just barely after the birth of the Universe. Think about that the next time someone comes at you on the highway with their extra bright lights on. Then in the early 1990's the blazar family grew. The EGRET experiment on board the Compton Gamma Ray Observatory discovered AGN that glowed brilliantly in gamma ray light. This was predicted in two papers  shortly after the discovery of blazars about a decade earlier. However, the large numbers found by Compton still took investigators by surprise. EGRET counted 66 gamma-ray blazars along with another 27 suspected. This has led to a whole host of discoveries, the most interesting possibly being that the gamma ray jets seem to be more tightly bound than the radio jets. It was not until the late 1990's that general consensus has formed that the gamma ray emission is largely due to inverse Compton scattering. Another important aspect of this discovery is that gamma ray-loud blazars may be a major source for the Cosmic Diffuse Background above 100MeV. Overall, gamma ray loud AGN have become so significant that every year more and more papers are published using EGRET's data. BL Lac is a fun object to observe. It's a point source in most small to medium sized telescope with wild and extreme variability. It is easily observed via CCD and visual observers. Observations are greately needed by the scientific community. Careful study of BL Lac and other blazars can help support or refute the widely accepted unified theory of AGN, which says that all AGN are basically the same - the differences are caused only in their orientation to our point of view. Many multi-wavelength BL Lac observing compaigns have been organized (such as the Whole Earth Blazar Telescope consisting of amateurs & professionals alike) and many more are certainly on the horizon. The questions surrounding AGN are hot topics in astronomy. So what can blazars tell us about the Universe we live in? Plenty. Because they are so intrinsically bright, we can see them at great distances, allow us to see further back in time. The furtherback we look, the more evidence we have to compare with big bang models and theories for the creation of the Universe. It also allows us to see a stage of time when things were different than today. Maybe back then dark matter was in a slightly different form or was more easily detectable than local dark matter in our own time. The high energy and variability of blazars give us direct evidence for the support of massive black holes at the center of galaxies and help us pinpoint the size of their accretion disks. But more importantly than the answers they give us are the new questions they pose to us. Why are galaxies no longer active? Could gamma ray bursts have something to do with AGN? Can we truly understand their variability? Why do some have emission lines and some don't? Finally, what does their variability tell us about dynamics in the hearts of galaxies and in high-speed jets? We are pretty sure we know what BL Lac is, but not exactly. We know it is basically a quasar with a strong jet pointed right at us. But we don't know the details about how it was formed and what causes variability. BL Lac was misunderstood twice. Once, we thought it was a variable star. Then we thought it was a simple blazar. Then, in the 90's, we had to relax the definition of blazars to keep BL Lac in that category. Each time we learned something new and each time we are getting a more detailed description of the BL Lac, and in doing so are getting closer to the truth. Imagine the Universe, Ask a High Energy Astronomer: What is a Blazar? "Extraglactic Objects Discovered As Variable Stars", Wolfgang Steinicke. "Active Galactic Nuclei: Sorting Out the Mess" by Ann Finkbeiner, Sky & Telescope, August 1992. "Newfound Quasar Wins Title: Most Distant in Universe"
 "Exploring Nature's Highest Energy Processes with the Gamma-ray Large Area Space Telescope Section 3: Blazars and Active Galactic Nuclei"
 "Relation between Gamma Ray Flares and Superluminal Components of Blazars"
 "The origin of TeV Gamma Rays in Blazars"
 "Gamma-ray Bursts, Bl Lacs, Supernovae and Interacting Galaxies"
 "What is Not Known About Blazars"
This month's Variable Star of the Month was prepared by Aaron Price, AAVSO Technical Assistant, UNIX, CGI.